Jan. 5, 2012 — The City of Golden on Jan. 5, 2012, filed a lawsuit in the United States District Court for the District of Colorado against the U.S. Fish and Wildlife Service to halt the transfer of federal land for the construction of the proposed Jefferson Parkway. Golden’s lawsuit maintains that the Fish and Wildlife Service violated environmental and other laws when it agreed to convey a strip of land in the Rocky Flats National Wildlife Refuge to the Jefferson Parkway Public Highway Authority. Among other things, the lawsuit alleges that the Fish and Wildlife Service (1) failed to conduct adequate environmental analysis of the effects of the property conveyance and the Jefferson Parkway, (2) unlawfully rejected Golden’s separate application for the strip of land, and (3) failed to ensure that environmental effects on the Refuge were minimized. Golden’s suit will likely be combined with another lawsuit filed earlier by the Town of Superior. Superior’s lawsuit focuses on other violations but also seeks to prevent the transfer of the land. Golden will provide additional updates on the schedule and process for this matter as they become available. Golden had offered its own proposal for the Rocky Flats land, focusing on bike and pedestrian paths instead of a toll road. While Golden argued that its proposal would better protect the Rocky Flats refuge and serve the region’s transportation needs, the Fish and Wildlife Service rejected it in favor of the Jefferson Parkway authority’s offer for the tract. As Golden reported late last month, negotiations with Jefferson County, Arvada, the Jefferson Parkway Public Highway Authority and the Colorado Department of Transportation (CDOT) ended without an agreement on transportation issues related to the proposed Jefferson Parkway. Golden believes that the discussions were constructive and that significant progress was made towards better regional cooperation on transportation issues. Golden remains appreciative of the leadership shown by Gov. John Hickenlooper and CDOT Executive Director Don Hunt in convening the discussions and highlighting the need for regional collaboration. While a lawsuit is one tool to promote appropriate regional transportation solutions, it is not the only one. Golden will continue to work constructively to identify collaborative solutions to the city and region’s transportation challenges. 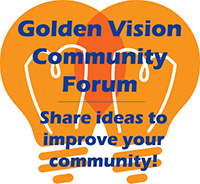 The feedback of Golden’s citizens will remain critical in the coming months as the city maps a course forward on these issues.